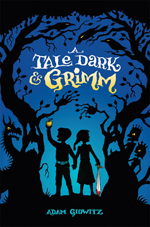 Adam Gidwitz ’04 turns classic folklore on its ear with his new children’s novel, A Tale Dark & Grimm (Dutton Juvenile, $16.99). 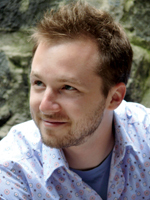 His debut book follows two familiar characters — Hansel and Gretel — through a series of unfamiliar situations. The young protagonists run away from home, defeat a dragon and rescue a family trapped in a cave, among other adventures. Gidwitz rewrites the original Grimm stories, mixing up plotlines and inserting a wisecracking narrator. The result is a distinctly modern fairy tale targeted toward children aged 10 and up. The author also grew up hearing various versions of the Grimm brothers’ more famous stories. He played Prince Charming in a high school produc­tion of Into the Woods. It wasn’t until he got to Col­um­bia, however, that Gidwitz began to think of fairy tales as literature. He read much of the Grimm canon in translation from German as homework for a seminar on children’s books led by the late Karl Kroeber ’56 GSAS, the Mellon Professor Emeritus in the Humanities. Kroeber taught Gidwitz to look at Grimm — and other children’s literature, including Winnie the Pooh and the Harry Potter series — from an academic standpoint. “I learned to take the stories for what they were rather than imposing my own structure on the text,” Gidwitz says. Columbia has had a profound impact on the way Gidwitz thinks and writes. An English major, he was inspired not only by his classes but also by the literary history and culture of the city. “The intellectual passion that I encountered at Columbia and in New York has been very influential in my life,” he says. Gidwitz spent his junior year in England, taking part in the University’s Oxford/Cambridge Scholars Program. While there, he was largely responsible for his own studies, meeting with a tutor only twice a week. During his year abroad, Gidwitz says, he developed the self-discipline necessary to become a productive writer. Columbia also fostered Gidwitz’s love of teaching. As a freshman, he volunteered for the East Harlem Tutorial Program, working with underprivileged elementary school children. By his sophomore year, he was helping to run the program. Gidwitz became deeply invested in his pupils and has stayed in touch with one student for nearly a decade. The boy, who was in the third grade when he met Gidwitz, now is a senior in high school. Gidwitz continued to teach after college. When he graduated from Columbia, he took a job at St. Ann’s School, a private K–12 academy in Brooklyn, while attending the Bank Street College of Education in the evenings. He graduated from the Bank Street program with master’s in both general education and special education. Gidwitz stayed on at St. Ann’s after finishing his graduate work. In the past seven years, he has worked with elementary, middle and high school students and has taught everything from basic math to advanced literary theory. Although he has been fascinated with the brothers Grimm since college, it was only after he started teaching at St. Ann’s that Gidwitz decided to write a new version of their stories. He hit on the idea for the novel while substituting for one of the school librarians. In an effort to entertain groups of second- and third-graders, he read aloud from his own copy of Grimms’ Tales for Young and Old. The children were captivated. Gidwitz strayed a bit from the text, pausing in strategic places to amuse and reassure his audience. He cracked jokes, offered comfort during tense moments and heightened his listeners’ interest by dropping hints about what would come next. This running commentary became the inspiration for his novel’s narrator. Gidwitz has continued teaching at St. Ann’s since the release of his book, and he has no plans to quit. In his spare time, he promotes the novel by doing just what inspired it in the first place: reading to children. The author’s publicity tour has taken him to schools, libraries and bookstores throughout the five boroughs and beyond. When he isn’t teaching or traveling, Gidwitz is working on his latest project, another novel-length fairy tale. This next book won’t be a straightforward sequel, however. Instead of carrying on the saga of Hansel and Gretel, Gidwitz is writing about two of their descendants — Jack and Jill. Grace Laidlaw ’11 majors in creative writing and psychology. She is director of Columbia’s peer counseling hotline and contributes regularly to CCT.